In Super Mario 3D World, the gameplay is top notch. It is just what you would expect from a high quality Super Mario game. 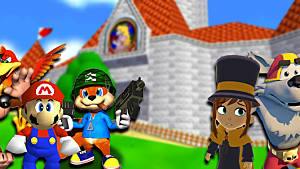 New power-ups like the Cat Suit, the Multiplier - which copies a the current version of your character that you can control - and the Goomba Suit - which makes all the enemies in the level simply ignore you. That definitely comes in handy on certain levels. The difficulty is extremely wide ranging. The first few worlds are really easy and is meant to get you used to the game and such. But when you hit the Bowser world, or any world after that (if you’re good) you should prepare with adult diapers and a mouth guard. Super Mario 3D World is basically a siren; lures you in (in this case with easy and fun levels) and then just devours your soul with insane platforming difficulty. I’m pretty sure that the final secret level, aptly named “Champion's Road” requires a virgin sacrifice in order to beat. No, I’m not exaggerating. It. Is. That. Hard. There are a few rehashed levels, but they are only in the later secret worlds. But don’t fear, they all have a new gimmick. 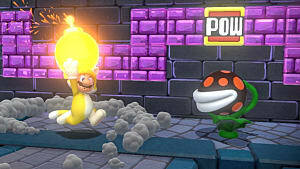 For instance: the Piranha Plant Jungle is now the “Piranha Plant Jungle After Dark.” New enemies, platforms move faster, and the only light you really have is torches scattered across the level. The majority of the levels and worlds in Super Mario 3D World are unique, well done and very fun to play. Except for Rainbow Dash, that level is the bane of my existence. There are “mini-game” esque levels in each world, where you have ten seconds to figure out a small puzzle: Kill all the enemies, reach the star, etc, etc. It's a nice alternative to the straight platforming of Super Mario. The touch screen is also integrated in some levels. Such as the “Hands-On Dojo” where you have to “slide” doors open, and ring gongs. There is also another new level featuring captain toad. He only has a handful of levels that you can play as him, but they’re really fun and interesting puzzle levels. You can use the Wii U controller to tilt the camera around to plot out your path and find secrets. Or you can just use the right thumb stick. Some platforms require a quick little gust of air from your wind pipes in order to rise up. Some really cool and interesting integration with the controller. I have not tried it yet, but I think you might be able to “tickle” or distract goomba’s by touching them on the Wii U Controller screen. There are a few boss fights as well. They all follow the same pattern of "Hits of three" but they're all unique and really cool. My favorite is without a doubt "Cat Boswer." To unlock the final secret world “Crown World” requires you to Get every Green Star in every previous level, get every Blue Stamp in all the previous levels, AND get the golden flag bonus on every level. The golden flag bonus is basically just jumping and hitting the very top of the flag pole for a 10,000 point bonus. Sounds easy right? Yeah, I thought so too, before I started hearing demonic whispers. After you finally unlock the Crown World (and if you do, you have my utmost respect) you are greeted with the one and only “Champion’s Road” god speed my friend, god speed. They are good. Nice and cartoony. Definitive Super Mario graphics. I mean, you really should not be worrying about how good the graphics in Super Mario is. You’re going to get the game for the game play and for fun. Most of the classic tracks are there, even some secret tracks like the Hyrule Overworld theme from the original Legend of Zelda. I’m not particularly a fan of the new tracks, they’re lacking soul, and a good catchy riff like the originals had. Plus, the song in Champion’s Road is not the greatest. Trying to beat Champion’s Road is frustrating, so much in fact that it will make you wish ill will upon the composer of that unfortunate song. All of the classic sounds are there as well. Well, the multiplayer. Playing with a friend will only infuriate the both of you, and playing with three other people will probably result in a ritual sacrifice. There is no split screen, so if one of your friends goes off-screen for too long they get sucked into a bubble and fly back to you. You can also use this to your advantage if one of your buddies is not the greatest Mario player; pressing the right bumper will “bubble” your character. The later levels just become rage inducing. For some odd reason you can pick up your friends character and throw them. I guess this is used for griefing? The attack, run, AND “pick up your friend” button is the same button. So if you two are next to each other and plan on running and jumping over a gap, be prepared for “OH SH**” and “DUDE, WHY DID YOU PICK ME UP! ?” I have no idea why this was even put in the game. Another annoying aspect is when you’re both in a tight area and one player jumps higher than the other. Basically if you jump and hit the feet of your friend, you skyrocket to the ground and they shoot upwards spinning like a top. 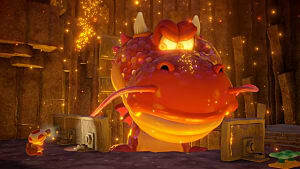 The harder levels will result in a lot of “One-man’s” being wasted because of this, especially when jumping over lava. Super Mario 3D World is an amazing game. 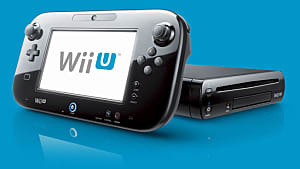 If you have a Wii U, then definitely pick this one up. If you don’t have a Wii U, then Super Mario 3D World is a great reason to buy one. The only downside of the game is the multiplayer. If you want to really enjoy the best this game has to offer then hide your other controllers and tell your friend that you’re sick with pneumonia or something. 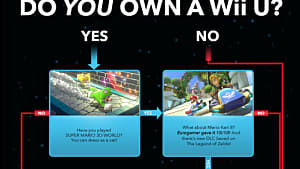 It’s a bit ironic of Nintendo to have an ad campaign about how you can “play with your friends!” in Super Mario 3D World, when the worst aspect of the game is playing with your friends. 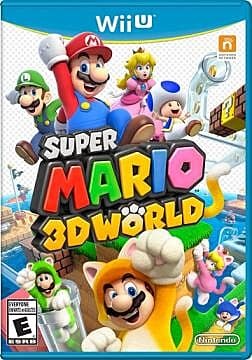 A copy of Super Mario 3D World was borrowed from a good friend, who purchased it from a local retailer. 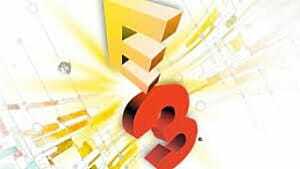 Super Mario 3D World was developed and published by Nintendo. My friend and I played together through the first eight worlds, and I finished up the last three secret worlds. 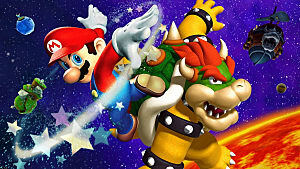 Super Mario 3D World is awesome! Multiplayer is infuriating though. Secrets, secrets everywhere.